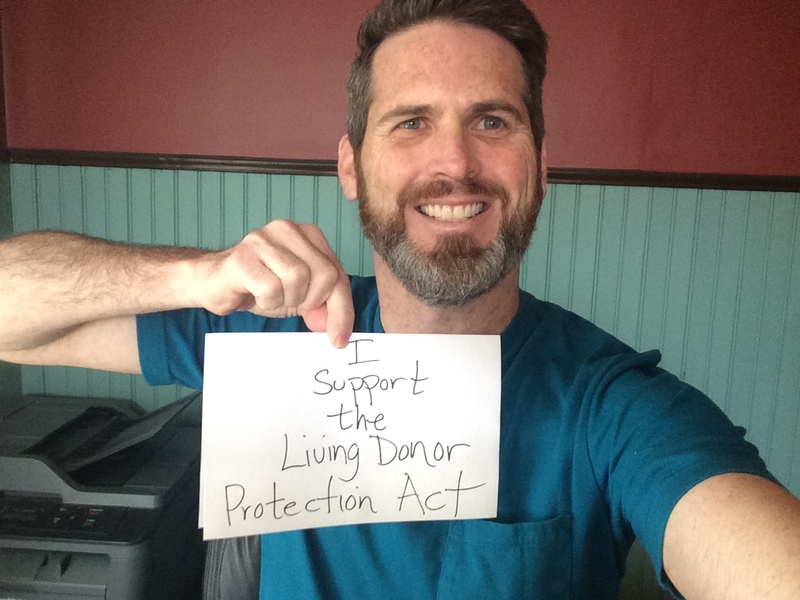 The Living Donor Protection Act prevents insurers from discriminating against kidney donors and guarantees that all donors are protected by the Family Medical Leave Act. It is an urgent priority across the kidney transplant field, and a much-needed first step for the transplant support agenda. No one should expect to be worse off because they donated a kidney. Please ask your federal legislators to support this Act by using the app to the right. Every message helps. It takes two minutes but will make a big difference. If you have time to customize it with your story and why you’re passionate about transplant, even better! Please ask your federal legislators to support the Act using the app below. Every letter helps. It will take two minutes but make a big difference. If you have time to customize it with your story and why you’re passionate about transplant, even better! Who is sponsoring the bill? The bill’s initial sponsors are Jerrold Nadler (D-NY) and Congressman Michael Burgess M.D. (R-TX), joined by Senator Kirsten Gillibrand (D-NY) and Senator Mark Kirk (R-IL), The best chance of getting this bill passed in law is persuading numerous other Senators and Members of Congress to co-sponsor the bill. That’s why we need your help to ask them to do the right thing and support the Act! The Family and Medical Leave Act (FMLA) does not specify that living organ donors can take unpaid leave to recover from their donation and does not guarantee that donors will have a job waiting for them after surgery. Despite taking this heroic step to save a life, living organ donors many times face discrimination when they try to take medical leave or buy insurance. Studies find anywhere from 11 to 25 percent of living organ donors experience difficulty securing or paying for insurance after their procedures because of discriminatory practices (See Boyarsky, 2014; Yang, 2007). What organizations are supporting the bill? The bill has broad support throughout the organ donation and transplantation field. Some of the organizations who support it are: American Association of Kidney Patients, American Living Organ Donors Fund, American Living Organ Donor Network, American Society of Nephrologists, American Society of Transplant Surgeons, American Society of Transplantation, American Transplant Foundation, Bay Area Association of Kidney Patients, Greater New York Hospital Association, John Brockington Foundation, LiveOnNY, The Living Bank, Living Kidney Donors Network, National Kidney Foundation, National Kidney Registry, National Marrow Donor Program, Nebraska Kidney Foundation, New England Organ Bank, New York Alliance for Donation, Renal Support Network, Stop Organ Trafficking Now!, Transplant First Academy, Transplant Recipients International Organization, Transplant Support Organization, and WaitList Zero. What would be the costs to taxpayers? This bill will not cost the government any money. If it increases living kidney donation by five percent, it would save Medicare about $400 million over the next 10 years. What are the potential impacts for kidney donation and transplantation? Passage of the bill would increase support for living donation and potentially result in more patients with kidney failure to receive transplants each year. There are over 100,000 people currently waiting for a kidney. Some wait as long as 7 years and many die while waiting (Unos.org). The wait and the associated deaths could be eliminated if these individuals had living donors willing and able to provide them with a life-saving kidney. Unfortunately, significant barriers exist – such as lack of reimbursement for lost wages and lack of work and health insurance protections – that keep willing donors from being able to donate. A 2006 study found that 39 percent of transplant centers reported that they had had eligible donors who declined to donate because they feared having future insurance problems.” (NATCO, 2006). How can I support the bill’s passage? All Americans can support the Living Donor Protection Act by sending your legislators a letter at the top of this page. Urge your Senators and Representatives to cosponsor H.R. 4616 and S. 2584 to help protect the rights of living donors! 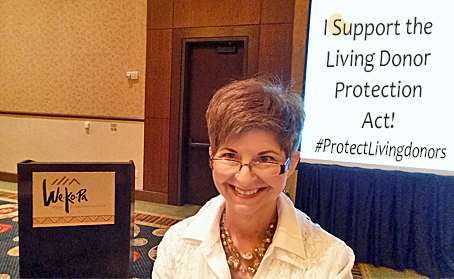 Protect living donors: Contact your Representative today!